Everyone wants to go to Burning Man but not everyone can go. Tickets are limited and they run on a strict timetable. Get acquainted with the ticket system and make yourself a plan on how to get to Burning Man. There are 5 distinct ticket sales for Burning Man. There’s Pre-Sale/Fo’Mo , Directed Group Sale, Main Sale, the OMG Sale, 4,500 Low income tickets. Each has different requirements and pricings. Before any of that though, you MUST sign up for a Burner Profile here or update your existing profile. You can only participate in these sales if you have a Burner Profile. Tickets range in price from $210 to $1400 each. The difference in price does not reflect a difference in experience or added benefits. The difference in price is a result of Burning Mans desire to create a diverse group of participants from varying socio-economic circumstances. If you will be driving into Black Rock City you will need a vehicle pass and it must be displayed on your windshield. The only exemptions are motorcycles and towed vehicles. Vehicles will not be allowed in Black Rock City, you will have to park at your camp. Vehicle passes are available for purchase during ticket sales. Pre-Sale is the only sale where you can purchase a maximum of 4 vehicle passes per order, in the rest of the sale the maximum is 1 per order. In total, 26,500 vehicle passes will be available for purchase for $80-$100 each plus fees and taxes. There are alternatives to driving to Black Rock City and is highly encouraged. For more information on alternatives and traffic issues facing the event read this article. Once you’ve gotten your Burner Profile set up you can register for any of the sales but you must register between February 12, 2019 – February 22, 2019. A Burner Profile is required, sign up or log in here to update it. The Directed Group Sale is targeted at those who will provide infrastructure to the event and therefore does not have an application process. Forms open at 12 pm noon PST we are just waiting on official date announcements. The Directed Group Sale is February 12, 2019 – February 22, 2019. There are 32,000 tickets available for $425 each plus fees and taxes and 15,000 vehicle passes are available for $80-$100 each plus fees and taxes. The maximum number of tickets an individual can purchase is two tickets and one vehicle pass. The second round of 3000 tickets at $500 will occur near the end of summer in the OMG sale. Once you’ve gotten your Burner Profile set up you can register for Pre-Sale through your Burner Profile. Registration is March 13, 2019 – March 15, 2019. There are 5,000 tickets available for purchase during presale so do not procrastinate. Ticket prices during presale are $1400 each plus fees and taxes. Although there are 4,000 tickets up for grabs, you can only purchase a maximum of 2 tickets with a maximum of 2 vehicle passes which are $100 plus fees and taxes. Vehicle passes can only be purchased with tickets, consider it as a packaged deal. It is possible to purchase tickets without purchasing a vehicle pass. Tickets purchased during presale are transferrable and qualify for name changes but they do not qualify to be resold through the Secure Ticket Exchange Program (STEP). All sales require a Burner Profile to start, sign up or log in here. You must also register prior to participating. You will not qualify to register if you have purchased tickets during the Directed Group Sale. Registration begins at 12 pm noon PDT on Wednesday, April 3, 2019, and ends at 12 pm noon PDT on Friday, April 5, 2019. Around 23,000 tickets are available for $425 each plus fees and taxes and around 10,000 vehicle passes are also available for $100 each plus fees and taxes. The maximum number of tickets you may purchase is 2 and 1 vehicle pass. All sales require a Burner Profile to start, sign up or log in here to update it. You will then have to register through your burner profile. Registration opens at 12 pm noon PDT on Monday, July 24, 2019, and ends at 12 pm noon PDT on Wednesday, July 26, 2019. If you have previously purchased $425 tickets through an earlier sale then you will not be able to register to buy tickets but you will be able to register to buy vehicle passes. The sale begins at 12 pm noon PDT on Wednesday, July 31, 2019. There are roughly 3000 tickets available for purchase for $550 each plus fees and taxes, and 1500 vehicle passes available for purchase for $80 each plus fees and taxes. The maximum number of tickets allowed for purchase per person is 2 and 1 vehicle pass. Delivery options for purchases during the OMG Sale are UPS 2nd Day Air (for those in the US), Canada UPS Expedited, and Will Call. All order will begin to be shipped out mid-June 2019. When purchasing tickets and vehicle passes, those within the US and Canada will be able to select shipping options. Those within the US will use USPS Signature Confirmation for $12 per order or UPS 2nd Day Air for $22 per order. Those in Canada will use Canada Post Regular Parcel for $29 per order or Canada UPS Expedited for $39 per order. For those outside of the US and Canada, the only option for delivery of purchase is Will Call. Those in qualifying areas will have the option of upgrading to international shipping. Those who use Will Call can pick up their purchase at the Box Office and will be charged $12 per order. All orders will have a $12 processing fee per ticket or vehicle pass. An additional 9% Nevada Live Entertainment Tax will be added to the price of every ticket purchased and 8$ of the 12$ of the per ticket service fee is also under this tax. Vehicle passes are not taxed or their service fees. The Secure Ticket Exchange Program, or STEP, is a program that the Burning Man official website offers to help those who want to resale their tickets and those who want to purchase tickets reliably. All tickets and vehicle passes that are sold through STEP are sold at face value, $425 for tickets and $80-$100 for vehicle passes plus taxes and fees. As with all things for Burning Man you must register through your Burner Profile. Registration for sellers for $425 tickets begins at 12 noon PDT on Wednesday, April 12, 2019. When you submit your ticket to the STEP process, you will then be given instructions on how to also submit vehicle passes. Tickets will not be eligible for STEP once it has begun the delivery process. The final day to submit tickets into STEP is Tuesday, May 31, 2019. For those with Will Call tickets the final date to submit tickets into STEP is Monday, July 17, 2019, at 12 pm noon PDT. Sellers will be refunded once the ticket is sold. The money will be refunded to the card originally used to purchase. Only those who have not purchased a $425 ticket through previous sales can register to purchase tickets through STEP. You cannot use STEP to purchase a vehicle pass alone. You may only register for STEP through a Burner Profile. Registration begins Wednesday, April 26, 2019, at 12 pm noon PDT putting you in a virtual line to be offered tickets as they are made available. If you remove yourself from this line you will not be able to re-enter it. The number of tickets available in STEP is completely dependent on the number of tickets previously purchased and that people choose to sell. When tickets are available through STEP for purchase, they will be dealt out on a first come first served basis through email notifications for those registered. Once you are offered tickets for purchase through STEP you have 72 hours to buy them before they are offered to the next person in line. Offers stop being sent out at 12 pm noon PDT on Friday, July 21, 2019, giving those who have been offered 72 hours to act. Those who are offered tickets through STEP will also be offered one vehicle pass. Purchases through STEP include usual fees and taxes and an additional $6 fee per item purchased. Purchases through STEP are transferable and qualify for name changes. They also have shipping options. Around 4500 tickets will be made available for purchase at $210 each for those with limited income. These tickets are non-transferable and are only available through application. Applications for the Low Income Ticket Program opens at 12 pm noon PST on Tuesday, February 12, 2019, and closes at 12 pm noon PDT on April 16, 2019, or once there are enough applicants. When applying do not fill out the application on a mobile device. Use the latest version of your browser but do not use Internet Explorer. You may only apply once per email address. It takes up to 12 weeks to review applications that are submitted. Make sure to check your emails spam and promo folders for possible missed updates. You will be notified about your application status whether you are approved or denied. If you have already purchased a ticket through previous sales then you will not be able to purchase a Low-Income ticket. Applications are for individuals only, although references to others applying are acceptable. You may only apply for yourself or for an applicant who has a disability that does not allow them to apply for themselves. You are required to use your full legal name and once given Low-Income status you will be asked to provide legal photo ID to receive your ticket at the Box Office. In the application process you must be able to prove your income and expenses, such as a W2 or pay stubs uploaded as single page 1 MB .jpg or .pdf files. Double check that your application is complete when you’re ready to submit it if it is not complete it will not be considered. All Low-Income tickets are Will Call and are held at the Box Office. Pick up or payment of tickets will begin on August 21. You will be able to purchase a vehicle pass when you pick up your ticket from the Box Office. Once approved for a Low-Income ticket you will not be able to purchase a ticket in later sales what so ever or your Low-Income status will be automatically revoked. Your Low-Income status will also be revoked if a ticket is transferred to your name. Kids under 12 get in for free with their parent or guardian who has a ticket. Each kid must have their own free print-at-home ticket. 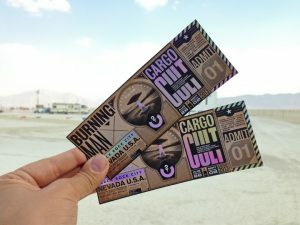 These tickets will be made available on the official Burning Man website. If you choose to purchase a ticket by a third party double check the vehicle pass or sticker number is not voided. The official Burning Man website will be actively updating a list of voided tickets. Voided tickets and passes are not valid for entry to Burning Man. Be cautious of tickets that delay in transferring through Ticketfly. Contact ticketsupport@burningman.org about marked-up tickets being offered along with screenshots and details. Burning Man does pursue those who resale for higher than agreed to prices. If you see marked up tickets on eBay you can directly report the seller to eBay. Overall, make sure you have a Burner Account! Know the dates for registrations and sales. Don’t procrastinate. Make yourself a game plan and a backup plan and maybe even another backup plan. With just a little forethought you can find yourself at Burning Man enjoying the experience of a lifetime.